So, Europe is back with a reunion and a new record. I was actually looking forward with interest to this new album as Europe was one of the first rock bands that hit me hard as a young boy still just humming along to Don’t Worry Be Happy daily. 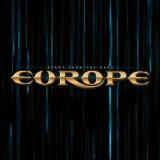 I think my first CD ever was a Best Of from Europe, which still holds great relevance in my record pile. This emphasizes the disappointment that Start From The Dark brings to me overall. The guys have definitely not decided to play it safe and rehash some eighties glories. It seems they’ve really tried to modernize their sound to match the times. The riffs, atmospheres and themes are quite heavy even in modern standards. When I read reports of this heavier direction before the release I thought it couldn’t at least do the band any bad, but while the heaviness factor has been upped, the catchiness has gone way down by comparison. Very little Rock The Night- or Cherokee-like crowd-chanting abound on any of the songs. Joey Tempests voice is still in fine form, even if he doesn’t go even as high as he did on the eighties records. Jon Norum is the biggest reason for a “Hurraah” on this record. His wahwah-induced lead playing brings a much needed grittiness to the otherwise terribly bland entirety. Michaelis keyboards – or moreover the almost utter lack of them – is the first major point I find a great letdown. The keys were always a big part of Europes sound but here they really take a back seat on most of the album for too long. Got To Have Faith starts the album with some nice grooving heaviness and a pretty catchy chorus. From there on, a desert of filler mounts up to block everything from its sight. There are good riffs, some nice vocal melodies, good acoustic bridges and Norums stylish soloing here and there, but as a whole very few of the songs make you want to listen to them again. Also the more rocking tunes like Flames & Wake Up Call don’t have that fast of a tempo, which plagues most of the album. Very little truly ripping, fast stuff abounds this disc. And it wouldn’t be a Europe disc without ballads, right? From the looks here, I wish it would be. The ballads like Hero, Roll With You or the dreadful, saccharine-drowned album closer Settle For Love make me wish that the whole album would have been more rocking if this is the best slow stuff the guys could come up with. Carrie and Ill Cry For You are a far far away ahead from these soulless and very un-passionate pieces of plodding lighter-sparkers. Even the one tune really trying to give some nicely up-tempo smashing, America, falls short of getting the attention of my ears. Spirit Of The Underdog luckily breaks the cycle of dull songs with a nice mix of keyboards (at least they gave Mic some space to play solo), heavy riffing in the infectious chorus and the more mellow verses. Again Norum shows his flair for some tuneful soloing, especially in the end of the song. I must say, this disc was seriously a disappointment for a “long-time” fan like myself. The production is good, good bits can be picked every so often and there is nothing really wrong with the bands playing. The most fundamental part, writing memorable songs, was just lost with me on Start From The Dark. Its not all bad, just terribly mediocre. I sure do miss Cherokee, Seven Doors Hotel or Superstitious when listening to this. Maybe next time the change of style turns out better results. We shall see, time and Europe will tell.